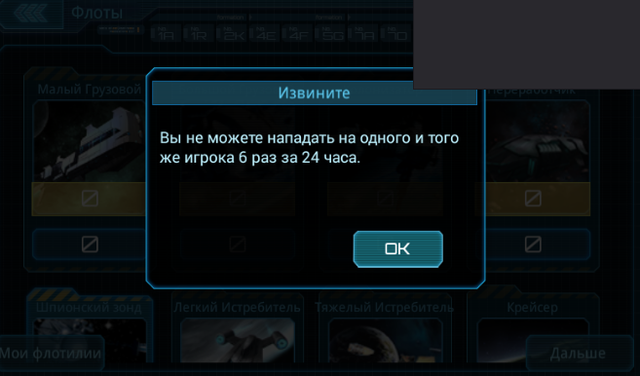 Dear developers, this is the end of the game.9 planets + 9 Moon and just can be 6 times to attack? for today we an awful lot of outrage on the administration response from techsupport no. no compensation for mistakes.you know what? we Russians are leaving the game. play it yourself. bashing attack limit to one player is 12 times in 24 hours. That's helps with cheaters creating guest accounts with a bot to attack someone every minute for 24 hours non- stop. But unfortunately that cheater just created another account and changed the bot to spy every minute instead of attack because of this change. It's this kind of botting that ruins the game more than anything. If they can make a bot to do that every minute, then what stops them from creating a Galaxy Pirate farming bot. what nonsense, what 12 times? I want to hit planets and moons at least 2-4 times, how will I steal resources from the enemy? if moons + planets are only 18, then the limit should be at least 4*18=72. With bots really think about how to fight, what JustNeo wrote some nonsense: how can you attack every minute if you can not send more than one army at a time, and after the attack on the planet is set to protect 2 hours. your limits it is not necessary because there are other mechanisms of restrictions. are total destruction of the game. Not nonsense when it only takes 30s for a probe to hit a moon again and again non-stop. Blame the creator of this bot for the restriction in the game. Now with new hit restriction, they changed the bot to spy every minute instead. What more changes will the devs have to come up to potentially ruin the gameplay for this idiots stupidity? Nyao create with the your problem - individual branch, do not abuse this the topic.